KDF Recruitment 2018: The Kenya Defence Forces KDF consist of: The Kenya Army;The Kenya Air Force; and The Kenya Navy and they have the mandate to protect the borders of our country Kenya. Kenyans have been warned about con men posing as military recruitment officers. The warning comes as the Kenya Defence Forces (KDF) recruitment drive starts today (12.02.2018), seeking to recruit more than 2,000 general recruits, constabularies and tradesmen. The exercise will end on March 13. Vice Chief of Defence Forces Lt Gen Joseph Kasaon is set to commission the recruitment that will be conducted in all constituencies. No one is expected to pay any money. Various organisations, including National Intelligence Service, the Ethics and Anti-Corruption Commission and civil society organisation Transparency International have been invited to observe the exercise as part of efforts to ensure transparency. Cases of corruption during police and military recruitment have been declining due to various measures that have been put in place. In 2016, there were five cases of corruption involving five people. At least Sh2 million was paid in bribes compared to 2014, when 16 people were involved and Sh4 million transacted. In 2013, Sh5 million was paid in bribes by various parties. Those seeking to join as general recruits must have scored a mean grade of D plain and above in their Form Four exams and be between 18 and 26 years old, while constabularies must be below 55 years, have no criminal record, be ex-KDF members with at least nine years’ colour service. The forces are looking for various tradesmen with diplomas in aeronautical engineering, automotive engineering, mass communication, psychology, education, telecommunication engineering, community oral health and marine engineering among other areas. Run and stretch: Days to the recruitment, embark on a two to three kilometer run twice a day with proper stretching. Drink water: Continuous drinking of water is crucial in rehydrating the body and aiding in circulation of blood besides assisting in removal of toxins from the body. Sleep: A good night sleep of not less than 6 hours helps the body rest and rejuvenate, ready for the next day’s activity. Avoid alcohol: Aware there will be physical exercises it is wise to avoid alcohol on the eve to your interview. Apart from inhibiting cognitive function, alcohol can generally weaken one’s body as a result of dehydration and overworking body organs. Eat well: Ensure you have a balanced breakfast on the material day as you continue to take in more water. The meal should be roughly three hours to the exercise. It is also vital to avoid meaty diets 12 hours before the test as this could be a recipe for dehydration. This will minimize cases of young men and women collapsing and in some instances losing their lives because of lack of preparedness or awareness of their physical and mental well being. Military physical fitness tests are not rocket science, if others can make it, then should you. 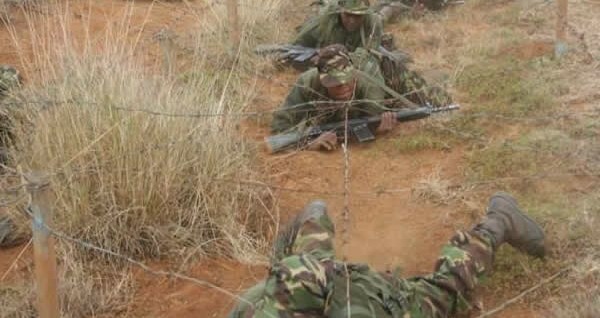 KDF 2019 Recruitment – Kenya Defence Forces Recruitment Dates and Centres. 1. The Kenya Defence Forces is pleased to announce to the general public the recruitment of Servicemen/ women, Constables & Tradesmen/women which is scheduled to take place from 12 February to 13 March 2018 at various centres countrywide. Prospective candidates wishing to join Kenya Defence Forces must satisfy the conditions and requirements given below. Bribery and other acts of corruption are against the law. All persons presenting themselves for recruitment purposes at any centre with fake/ falsified calling letters, identity cards, academic certificates etc. or caught engaging in any corrupt activity shall be arrested and prosecuted. If you accept to be conned, you will lose your money and go to jail; it happened to many during the last recruitment. Do not waste your money and risk imprisonment; No one can influence the recruitment process. Report any suspicious activities/conmen to the nearest police station or a military camp. KDF recruitment is absolutely free to all. 3. Citizens are further notified that recruitment is only conducted at the advertised recruitment centres countrywide during daytime before 1800 hours (6pm) on weekdays. Successful candidates will be issued with calling letters at the recruitment centres by the recruiting officers. Any person purporting to recruit or issue an alleged calling letter away from a recruitment centre will be doing so fraudulently. a. The KDF Recruiting Teams consisting of Kenya Army, Kenya Air Force, Kenya Navy and Defence Forces Constabulary will be visiting the recruiting centres as indicated below to recruit Servicemen/ Women, Defence Forces Constables on dates indicated. b. All potential candidates reporting to the recruitment centres should come from the sub counties/ divisions of their respective counties and districts. They should also bring with them current original national identity card and academic certificates/ testimonials. ID photocopies/ scanned and police abstract will not be accepted. The recruitment exercise will be absolutely Free. (1) Must be Kenyan citizens. (2) Age: Between 18 and 26 years old. (3) Be physically and mentally fit in accordance with the KDF standards. (4) Have no criminal record. (a) Men 1.60m (5ft 3in). (a) Men: 54.55 Kg (120 lb). (b) Women: 50.00 Kg (110 lb). 7. Female candidates must Not be pregnant at recruitment and during training. 8. Education: A minimum of mean grade D (plain) in KCSE for the general recruits. (2) Be in Possession of valid Kenyan National Identity card. (3) Be between the ages of 30 and 55 years. (4) Be ex-Kenya Defence Forces Service Member. (5) Possess a Discharge Certificate of minimum “Very Good” in conduct. (6) Must have served at least 3 or 9 years colour service. (7) Be physically and medically fit in accordance with the KDF standards. (8) Have no criminal record. (9) Female candidates must NOT be pregnant at recruitment and during training. a. Prospective candidates wishing to apply must satisfy the conditions and requirements given below. (c) Men: 54.55 Kg (120 lb). (d) Women: 50.00 Kg (110 lb). (7) Female candidates must Not be pregnant at recruitment and during training. Must have a minimum of C – (minus) in KCSE, a Diploma in Catechetical studies from a recognized catechetical college/ institute and should not be beyond 35 years of age. A minimum of mean grade D + (plus) in KCSE and either a relevant certificate with Government Trade Test Grade II or Craft II from a recognized Institution. The Kenya Defence Forces (KDF) has announced the recruitment of general service officer cadets and special officers. In an advert in the local dailies, prospective recruits must be Kenyans with no dual citizenship and must be aged between 18 and 26 years. KDF pointed out that they must also be physically and medically fit in accordance with the KDF standards while having no criminal records. “General service officer cadets must hold a mean grade of B (plain) in KCSE with at least C+ in English, Mathematics and one Science subject. The initial training period for this category will cover three continuous years leading to a BSc n Military Science and Security Studies on successful completion,” it stated. The advert further stated that female candidates must not be pregnant at the time of recruitment and during the entire duration of training. It is a constitutional requirement that the composition of the command of the Defence Forces reﬂects the regional and ethnic diversity of the people of Kenya. The supreme organ overseeing all matters pertaining to the Defence Forces is the Defence Council, which is also a constitutionally established body. Kenya Defence Forces role prior to the promulgation of the new Constitution was two fold — the primary role was to defend the sovereignty of the Republic and the secondary one was to assist the civil authority when called upon. The process of calling upon the Defence Forces entails a decision that the breach in law and order is such that the police services can no longer contain it. In the case of general breaches, the President and Commander-in-Chief of the Defence Forces of the Republic of Kenya may directly invoke the Preservation of Public Security Act Cap 57. Regulations, Public Security (Armed Forces) Order section 2(1) and confer them the full powers, protection and privileges of police officers in the designated area. After calling upon, the Defence Forces employ the appropriate means (minimum necessary forces), to bring the situation back to a condition where police can once again operate effectively. The invite is formalised by a gazette notice that is issued after but not more than 21 days; or prior to the employment. Calling upon requires Parliamentary sanction. Therefore both the President and the Minister may seek parliamentary authorisation post facto before twenty one days expire, or abinitio. Kenyans have cried on the Defence Forces when they become victims of external aggression; such as the Todenyang in Turkana and the Migingo Island (Nyanza) cases. The new Constitution has now defined the roles of the Kenya Defence to be the defence and protection of the sovereignty and territorial integrity of the Republic, assist and cooperate with other authorities in situations of emergency or disaster, and the restoration of peace in any part of Kenya affected by unrest or instability, when approved to do so by the National Assembly. The forces so committed shall perform these roles under the supervision and control of the Defence Council but being directly answerable to the National Assembly. This subordinates the Defence Forces to civil authority, or put more clearly, the people of Kenya. Support fighting units during war—time by providing personnel for military installations where women were assigned roles such secretarial, clerical, logistics, medical and communication. Perform administrative roles during peace time. Provide employment opportunities to women in a male dominated field. In disbanding this Corps in 2000, the KDF seemed to anticipate the constitutional requirement of including all citizens rather than viewing them as interest groups. Previously, it was a policy requirement that women could not be assigned roles in the fighting units and could only offer back-up and support services. But with massive strides in the technological evolution of warfare and leaps made in an education system that offered equal opportunities to men and women, this policy slowly became redundant. Women were as good as men in operating the new systems that were becoming part of the KDF inventory. They are now recruited and assigned roles into all the Limits of the Defence Forces, just as are the men. The last Commanding Officer of the Women’s Service Corps was Lt—Col Martha Waithaka, a nurse by profession. Arising from the national values and principles set out in the new Constitution, Kenya has set out a foreign policy containing a clear set of objectives that she has defined and endeavours to achieve to ensure maximum protection and promotion of the national interest. Security and defence policy is an integral part ofthis foreign policy. Preservation of Kenya’s freedom, her political identity and the institutions that form the foundation of freedom and political identity. Protection of Kenya’s territory, her citizens and its vital interests from armed attack. Fostering a regional and international order supportive of the national interests through cooperation relationships. Protection of Kenya’s markets to maintain national productive capacity and the nation’s economic well being. Ruling out the threat or use force as a means of settling disputes between states. Achieving a stable balance of forces at the lowest possible level to ensure security. Kenya’s defence policy is determined by the country’s national interest as defined by the Constitution. It is articulated by its people and shaped by the country’s political leadership. The policy guarantees the nation’s independence and national dignity. The policy fosters economic interests and activities. It is designed to guard the national political boundaries against both internal and external armed aggression. Importantly the defence policy encompasses the historical, political, social and economic interests that the nation harbours. The Defence Forces, therefore, could be used to inﬂuence threat as is perceived across the borders or otherwise. Consequently, the forces are configured to counter aggression, or better still, to deter potential adversaries from launching any attack by ensuring the outcome is acceptable. Modernising and updating of the forces to cater for contingencies is essential and an ongoing programme across all services. Kenya’s territorial integrity and particularly its tourist industry by the Somali Islamist militia known as Al Shabaab. It was the ﬁrst armed campaign that Kenya had launched outside its borders since independence in 1963. Kenya’s defence forces policy is derived from the need to defend itself against any external aggression. However, it is now recognised that the threat to a country’s stability can also be internal. The mission of a nation’s security and defence organisation is to ensure security by effectively implementing the nation’s policies on security and defence. Military power is the surest means of protecting the national interest, for justice without force is impotent. Economic and political power are imperiled without the military power to back them up and a well heeled military organisation is a source of pride, prestige and respect for the nation. Ensure national security by deterring war and other forms of violent conflict involving the nation. Should deterrence fail, resolve the conﬂict on terms most favorable to the nation. Security and defence policy dictates that the forces should be held in operational readiness and their organisation, equipment and procedures for exercising command and control should be tailored towards meeting the role and missions of the forces in peacetime, national emergency or crisis and in war. The forces should be organized and deployed to defend national territory and other interests. However, an offensive capability is an essential component of an effective defence posture, and the force should therefore be capable of projecting power on to the territory of an adversary. This is precisely what happened in the case of the Al Shabaab threat. After determining that containing the threat was not enough, the forces rolled across the border but only in accordance with the strict terms setforth by the Constitution which dictate parliamentary approval of the action. Importantly, the campaign had all three components in balance -land, air and sea as dictated by the defence policy. An Act of Parliament to provide for the functions, organization, administration and discipline of the Kenya Army, the Kenya Air Force and the Kenya Navy and their reserves; to make provision in relation to seconded and attached personnel and visiting forces; and for purposes connected therewith or incidental thereto. The present structure of the Defence Forces is provided for by the Constitution, which places the Head of Stateas the Commander-in-Chief of the Kenya Defence Forces, namely the Kenya Army, the Kenya Air Force and the Kenya Navy. The Kenya Defence Forces contribute to the overall capability on land, in the air and at sea. Each service consists of three basic elements of a headquarters organisation, support and ﬁeld forces. The Defence Forces Headquarters functions as the technical department for national defence within the policy guidelines laid down by Parliament and the Cabinet in accordance with the Constitution. It is the supreme administrative authority for the civilian and military departments. The political authority over the Defence Headquarters is vested in the Minister of State in charge of Defence. The Constitution refers to him as the Cabinet Secretary responsible for Defence. All directives and instructions are issued on his behalf, thereby extending political control over the defence forces in their day to day functions. The Secretary as the chairperson. The Chief of the Defence Forces. The Principal Secretary in the Ministry of Defence. The duties and responsibilities of the Defence Council are overall policy, control and super-vision of the Defence Forces; and performance of any other functions prescribed by national legislation. Day to day administration of the Defence Forces. Command and control of the Army, the Air force and the Navy are exercised by the Service Commanders who are appointed by the C0mmander-in-Chief. The Service Commanders are responsible to the CDF for operational readiness of the individual services and the development and implementation of an overall concept of military defence. The Principal Secretary in the Ministry responsible for Defence. The Ministry of State for Defence is part of the Office of the President. The President, as Commander-in-Chief of the Defence Forces, appoints senior military officers such as the Chief of the Defence Forces, the nati0ns top soldier, and service commanders. The Minister of State for Defence, as Cabinet Secretary presides over the Defence Council. In military doctrine, the primary role of defending the country against external aggression includes deterring potential enemies from breaching the nations sovereignty, thus averting the necessity of going to war. In the 50 years of Kenyas independence, Kenyas military has crossed another countrys borders in anger only once and that was in 2011 when Operation Linda Nchi was launched to pursue the rag tag Somali militia, Al Shabaab. Fighting under the auspices of the African Union Mission in Somalia (Amisom), KDF Went all the Way to rout the militia in its stronghold in the port city of Kismayu. We are, as it should be, servants of our people because they trust us with their lives. Before their lives are threatened, we shall have put our lives on the line first. This is the true and sacred hallmark of a professional soldier ready at all times to pay the ultimate price for survival of the country. At some point in our lives, we all abandon this earthly journey When death comes knocking. But to a soldier, death in defence of motherland is the ultimate honour. This is what sets us apart from other citizens. Above all, we are because the people of Kenya are. Five KDF soldiers died and 11 were injured during the storming of the Westgate Mall in the operation to rescue civilians held hostage by terrorists. It was not the first time that KDF had had to confront the evil handiwork of terrorists; in 1998, the military was involved in a large scale rescue effort following the bomb blasts at the US Embassy in Nairobi. As an institution, the KDF has come a long way since the long years of invisibility during which the country witnessed spectacular incidents of armed threat to civilian life Migingo, Todenyang, Al Shabaab drove Kenyans into questioning their exact role in so far as security provision was concerned. Things are dramatically different today. With Operation Linda Nchi and the assault on the Westgate Mall, KDF is now a visible and constant presence in the discourse of public life in Kenya. Since Independence, seven African chiefs have led KDF. They are Generals Joseph Ndolo, Jackson Mulinge, Mahmoud Mohammed, Daudi Tonje, Joseph Kibwana, Jeremiah Kianga and Julius Karangi. Of these, two easily stand out Tonje and Karangi. Gen Karangi, known as The Hammer in his Air Force service, has expunged the wimp image of the Defence Forces by orchestrating Operation Linda Nchi. But it was the scholarly British educated Tonje who revamped the military with far reaching reforms that changed everything from its posture vis a vis its perceived enemies, education requirements for its personnel, procurement regulations to term limits. All these and others were done in four years. Tonje was known for his love of books and strong moral backbone. In an address to graduands at the Defence Staff College, he congratulated the happy students with this advice: Only results count and remember the World doesnt owe you a living. Nor can you rely on connections, subterfuge or guile. These may work for a While but not in the long run. Be Warned: success will only come to those who have the convictions of their beliefs, are morally upright, straightforward in their dealings, honest, diligent, courageous and above all loyal to their unit, their service, the government and the country. He commanded KDF at a time when Kenya was actively involved in peacekeeping operations around the world and he became an expert in that field. His views on this subject reveal an incisive and highly analytical mind. He wrote in one paper: Since the 1990s, internal Wars in Africa are brutal in nature and are driven mostly by political ambitions or greed, preying on ethnic or religious differences, often sustained by external economic interests and fed by a hyperactive and in large part illicit global arms market. Additional contributors to these intra state conﬂicts are the end of the Cold War, economic crisis in the affected countries, decay in physical infrastructure, institutional collapse, political opportunists, easy access to arms, multiple armies or bandits and humanitarian emergencies. In the 1990s Tonje Was Chief between 1996 and 2000. KDF was engaged in peacekeeping and support operations in Angola, Namibia, Mozambique, Southern Sudan, DRC, Somalia, Sierra Leone, Macedonia, Croatia and East Timor. It contributed troops and military observers to UN and AU sponsored missions totaling over 10,000 soldiers, observers and staff officers Worldwide. The most internationally prominent peacekeeper KDF has ever produced was Gen Daniel Opande, who was the Force Commander of the United Nations Mission to Sierra Leone, amongst other high profile engagements. Since independence, the Government has often called upon KDF to help in disasters such floods, collapsed buildings, terrorist attacks, fires and to supplement civilian efforts in the provision of services such as water and medical care. KDF has also been deployed in the construction of many public Works, including bridges and schools. Its Engineers Battalion has sunk boreholes in arid lands in Eastern and Northern Kenya. Kenyas military is also a significant player in higher education for soldiers and other Government employees both for Kenyan citizens and friendly African nations. Its National Defence College, launched in 1997, provides participants with the opportunity to study, analyses and orchestrate national security issues relating to domestic, foreign, economic and defence policies. The college is administered by an officer of the rank of Lt General as the Commandant and is divided into two divisions Faculty and Administration. Four Directing Staff, all of the rank of Major General and coming from the Army, Air Force and Navy, assist the Commandant. The Kenya Defence Forces have provided stable careers for hundreds of thousands of Kenyans. Some have risen to the highest ranks while others have left to become professionals in civilian life. A small but significant number have joined politics and become Members of Parliament, with a few serving as Cabinet ministers. Kenyas military has also produced some of the Worlds best-known athletes. Famed distance runners such marathoners Paul Tergat and World champion distance runners such as Henry Rono and John Ngugi began their careers in the Kenya Defence Forces. Generally, standard military employment in support of the civil power includes assisting the police in dealing with riots and other civil disturbances, guarding key points, helping to maintain essential supplies and services and to bring relief during natural disasters. The military in this role operates under the domestic law of Kenya, together with accepted international law provisions relating to the protection of basic human rights. The military is expected to observe existing law on use of force, powers of arrest and search as well as liability for Wrongful acts; No employment of the armed forces, either in international or non—international armed conflict, may be executed Without due regulation of the law. As in all democracies, the Kenya Defence Forces are a tool of the civil power. The President, with the constitutional designation of Commander-in-Chief, is empowered to retain responsibility for organisation and command of the military. The President and the Defence Council control all attachments and employment in the military or cooperation with other forces locally and abroad. In addition, Parliament retains supervisory power over the defence forces in funding. All military expenditure requires parliamentary authority through the annual financial approvals. Scrutiny of this expenditure is ensured through the annual report of the Controller and Auditor-General. The lines, limits and controls over the Kenyan Defence Forces by the civil power are clear and represent the constitutional intention to control military intervention through the democratic processes of the country. Kenyas military reﬂects the rich cultural mix of the nation with virtually all ethnic groups represented in it. The Kenya Defence Forces traces its origins to the 19th century era of the Kings African Riﬂes The last quarter of this period was characterized by the active involvement of the British Government in the enforcement of the abolition of the slave trade in the East African region. Their main ally in this campaign was the Sultan of Zanzibar. However, the Sultan was under great pressure from a variety of interest groups not to end the trade, it being a major source of income. At the same time, other European countries were actively developing their spheres of inﬂuence in Africa. To deal with these challenges, the British Government established the Imperial British East Africa Company to safeguard its interests. As these interests expanded, the need arose to create a strong force that could both project power and expand inﬂuence. It is out of this private force that the first indigenous land forces, the precursor of the present Kenya Defence Forces, can be traced. Kenya Defence Forces Training Kenya Defence Forces recruits undertaking Assault course training at the Recruits Training School, Eldoret. These are the major milestones of the Kenya Defence Forces since independence. The Kenya National Assembly passes the Armed Forces Act to establish the newly independent nations military. Kenya Army forces are moved to Northern Kenya to contain an insurrection by separatists seeking to secede from Kenya. The newly—independent Kenya Government is legally empowered to assign names to Army units as it deems necessary. 5 Kings African Rifles and 3 Kings African Riﬂes are renamed 5 Kenya Riﬂes and 3 Kenya Riﬂes accordingly. School of Ordinance is established to take over from the Royal Army Ordinance Corps (RAOC). The Kenya Air Force and the Kenya Navy are established by Acts of Parliament. Mutiny and disbandment of11KR Formation of 1KR under Lt Col Anderson (the Commanding Officer 3KR). Handing over of 3KR to Lt Col Mulinge, who becomes the first African commanding officer. 1KR is given its first colours. First of 40 officers and men sent to United Kingdom for parachute basic training. Kenya Army Electrical Mechanical Engineering is established. Establishment of Kahawa as a Garrison under Lt Col Nzioka. Kenya Army Pool of Instructors name changed to Kenya Army Education Corps. First Military Police selected to join Corps of Military Police. First independent Parachute Company formed in Gilgil. Formation of Engineer Squadron at Gilgil. First Kenyan naval graduates return from the UK to assume their duties. They are S. Suero, J.C.J. Kimaro, J.R.E. Kibwana, N. Gatonye, E. S Mbilu, TG Mula, Buni Rua, R. Musau and B.O.C. Onyango. Birth of Kenya Armed Forces Comrades Association (KAFOCA) to include Kenya Air Force and Kenya Navy. The first Artillery Battery is formed and first firing is done on Menengai Crater. Kenya Army Recce troop (of Armour) is formed with three newly acquired Saladin cars. First Parachute basic course is run in Kenya. Formation of 7 KR at Gilgil Barracks. K — Formation of Transport Battalion. Armed Forces Constabulary formed through an Act of Parliament. — Mzee Jomo Kenyatta visits 7 Kenya Riﬂes for the first time. 7 Kenya Riﬂes is presented with both presidential and unit colours. Expansion of Engineers squadron to a Battalion and relocated to Nanyuki under Lt Col T Ndunda. Group Captain J. Edwards, the last British officer to command the Kenya Air Force, takes command at Eastleigh. Formation of company of Transport Battalion-with M / Benz trucks from Germany. The first military legal officer, Mr. E.N. Njatha is commissioned. First AML 245 model is received from France and forms the first squadron of the present 76 ARB. Lt Col J.C.J. Kimaro appointed first indigenous commander of the Kenya Navy. Establishment of 42 Field Workshop in Kahawa Garrison. Col D.N. Gichuru appointed the first indigenous commander of the Kenya Air Force. 7 Kenya Riﬂes moves to Langata Barracks. 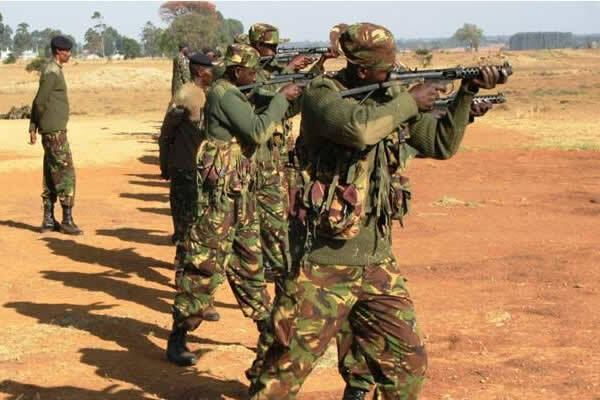 7 Kenya Riﬂes troops it colour for the first time. Formation of 75 Artillery Battalion. Eastern Command activated at Nanyuki under Col Ayub during the Ogaden War. Formation of 78 Tank Regiment. Formation of 77 Artillery Battalion. The idea of its formation was mooted in 1977. 50 Air Calvary Battalion is formed. Establishment of Armored brigade headquarters. Establishment of School of Armour within Armored Brigade in Nakuru. Formation of 9 Kenya Riﬂes with Lt Col Opande as its first commanding officer. School of Signal assumes its current name. Formation of 81 Tank Battalion Establishment of Embakasi Garrison under Brig Kipsaita. Ground Air Defence Unit (GADU) changed to 75 Artillery Battalion under Artillery Brigade and remains at Embakasi. A coup attempt by non-commissioned officers of the Kenya Air Force is crushed by the Kenya Army. The Air Force is renamed 82 Air Force. KAF Eastleigh renamed Moi Air Base and KAF Nanyuki renamed Laikipia Air Base. Air Force Commander Maj. Gen PM Kariuki is relieved of command, tried and jailed for four years for failing to suppress the mutiny. Establishment of Parachute Battalion under Major Rob (late Brig Rob). Unit later renamed 20 Parachute Battalion. Establishment of Joint Helicopter Training School. 42 Field Workshop is relocated to Nanyuki. Establishment of Central Overhaul Workshop (COW) forcing the relocation. Electrical and Mechanical Engineer headquarters moves to current location of Kenya Army Corps of Signal. 20 Parachute Battalion presented with colours under Lt Col Chuma. Transport Corps status is granted. Joint Helicopter Training School renamed Helicopter Training School. Kenya Army Corps of Signal is established with a view of superintending over all Army communication systems. Electrical and Mechanical Engineers headquarters moves to current location. Introduction of Kenya Armed Forces Medical Scheme (AFMTS) whose greatest membership is drawn from the Kenya Army. Establishment of Western and Eastern Commands. Somalia militia infiltrates Kenya at AMUMA in North Eastern Kenya and are successfully countered by the Kenya Army forces. Dissolution of the merger between ALCOM and Kenya Army Corps of Transport. Relaunch of Kenya Army Corps of Transport. 7 Kenya Riﬂes hosts the outgoing Commander-in-Chief. The Army plays a key role in transition of leadership of the country. International Mine Action Training Centre (IMATC) is established at Embakasi. Kenya Defence Forces enter Somalia in Operation Linda Nchi to pursue the Islamist militia Al Shabaab. Victory is declared with the capture of the militias stronghold city of Kismayu. Chiefs of Kenyas Defence Forces the top soldier in the Kenya Defence Forces is the Chief of the Defence Forces (CDF). He is the only officer who holds the rank of four-star General. The first officer to hold the post, still then known as Chief of Defence Forces, was Maj Gen J .M.L. Ndolo Who left office after being implicated in a coup against the Government of President Jomo Kenyatta in 1971. Maj Gen J.K. Mulinge, who later became the first officer to assume the rank of a full general, succeeded him. The most reform-minded Chief of General Staff, as the title later became, in the countrys history was General D.R.C. Tonje who instituted wide ranging changes in the defence forces, including splitting the army into two Commands Western and Eastern imposing clear retirement and succession rules and vastly expanding the Kenya defence forces training programme. He also strengthened the Kenya Armed Forces Comrades Association, the militarys retirement organisation. Other officers to hold the rank of General and head the Defence Forces have been Mahmoud Mohammed, J.R.E. Kibwana, J .Kianga, Julius Waweru Karangi and the current one, Samson Mwathathe. It is under Karangi that Kenyas Defence Forces invaded another country for the first time in the nations history. Of the three services, only an officer of the rank of Lt Gen commands the Army, which is next in line to that of a full general. Major Generals command the Kenya Air Force and the Kenya Navy. Traditionally, two other officers also carry the rank of Lt General in the nations defence structure. These are the Vice Chief of General Staff and the Commandant of the National Defence College, the militarys top higher education institution. Lt Gen Joseph Kasaon 2010 — to date. Kenya Defence Forces salaries will be update soon.